Students are usually introduced to repertoire that has a heavy emphasis on the treble staff first… leaving the bass staff notes to be rushed in down the road. This type of introduction to note reading gives young students very little time to properly process those bass clef notes. As a result, students learn to “make do”… and never really master those pesky notes. Needless to say, practice with bass clef note reading is something from which all students can benefit. So today we’re sharing a printable that takes an in-context, game-based approach to mastering the bass clef. 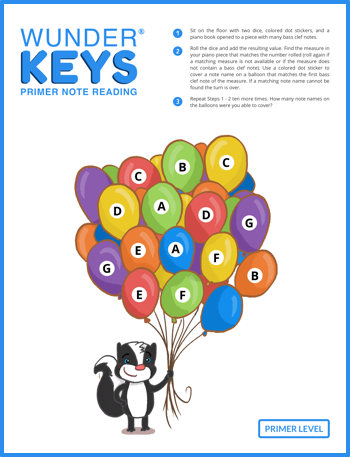 To have a blast reinforcing bass clef note reading, click on the image below to download today’s printable. And while you’re here, don’t forget to check out our WunderKeys Method Books on Amazon. Our consistent and equal-emphasis approach to teaching note reading in our Primer-Level method books means bass clef note-reading issues will be a thing of the past in your studio!